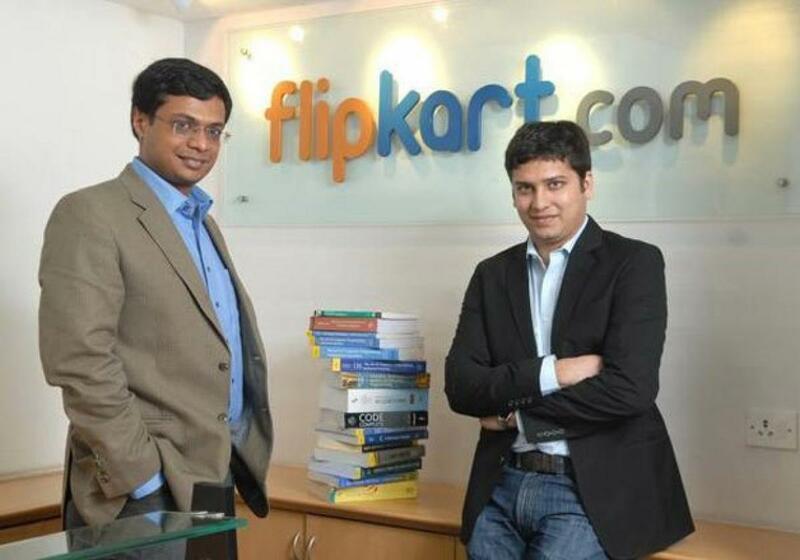 Leading Indian e-retailer Flipkart\'s co-founders Sachin Bansal and Binny Bansal are the latest billionaires in the country, with $1.3 billion (Rs.8,582 crore) net worth each, according to leading business magazine Forbes India\' rich list released on Wednesday. Leading Indian e-retailer Flipkart's co-founders Sachin Bansal and Binny Bansal are the latest billionaires in the country, with $1.3 billion (Rs.8,582 crore) net worth each, according to leading business magazine Forbes India' rich list released on Wednesday. "Indian e-commerce has added its first billionaires with Flipkart's founders (Bansals) making debut on our rich list at number 86, with $1.3 billion net worth each," the magazine said in a statement here. Though Reliance Industries Ltd (RIL) chairman Mukesh Ambani tops the rich list for the ninth consecutive year, his net worth, however, declined $4.7 billion to $18.9 billion (Rs.127,700 crore) from 2014 owing to lower oil prices that hit his oil and petrochemicals giant. Sun Pharmaceutical's Dilip Shanghvi also retained the second spot, with $18 billion net worth, acquisition of drug major Ranbaxy Industries for $4 billion by his company notwithstanding. IT czar and Wipro chairman Azim Premji also retained the third spot in the list, with a net worth of $15.9 billion though $500 million less than in 2014. "The generous billionaire has pledged 18 percent of his stake in Wipro to his charitable trust, in addition to a 21 percent stake already given," the statement noted. "The combined wealth of India's 100 richest remains largely unchanged at $345 billion, as compared to $346 billion in 2014," it added. Similarly, wealth of 10 tycoons slumped by $1 billion over the year owing to global and domestic factors, including a volatile stock market and currency fluctuations. Fortune of steel magnate L.N. Mittal (65) declined by $4.6 billion to $11.2 billion and his ranking in the rich list slipped to eight from five year ago, as his and world's largest steel major ArcelorMittal was hit by imports from China. "India is facing a reality check in 2015 after the euphoria in 2014. Though it has impacted several big fortunes in the top 100, the country's entrepreneurial spirit remains buoyant, as evident from a dozen new faces on the list," said Forbes Asia's India editor Naazneen Karmali. Other top 10 billionaires are Hinduja brothers ranked fourth with $14.8 billion net worth; Pallonji Mistry (86), fifth, $14.7 billion; Shiv Nadar (70), sixth, $12.9 billion; Godrej family, seventh, $11.4 billion; Cyrus Poonawalla (74), ninth, $7.9 billion and Kumar Mangalam Birla (48) tenth, $7.8 billion. Gujarat-based Adani group's founder chairman Gautam Adani (53) is ranked 11th with net worth of $7 billion and Kotak Mahindra Bank vice-chairman and managing director Uday Kotak (56) is 12th with $6.5 billion net worth. Only two women figure in the top 100 billionaires' list - Leena (Gandhi) Tewari (58 years), chairman of drug major USV Ltd, is ranked 54 with $1.9 billion net worth, while Indu Jain (79 years), chairperson of the country's largest media group Bennett, Coleman & Co Ltd, is ranked 57 with $1.85 billion net worth. Five co-founders of global software major Infosys Ltd figure in the rich list- N.R. Narayana Murthy (69) ranked 53, $1.92 billion; S. Gopalakrishnan (60), 67, $1.67 billion; Nandan Nilekani (60), 69, $1.61 billion and K. Dinesh (61) 96, $1.19 billion. Mahindra group chairman Anand Mahindra (60) is ranked at 99 with a net worth of $1.12 billion. The rich list also has 12 new comers, including IndiGo budget carrier co-founder Rakesh Gangwal at 70 with $1.6 billion net worth, while his friend and co-founder Rahul Bhatia moved up 12 positions from last year to 38 with $2.4 billion net worth. The biggest gainer is Poonawalla, the vaccine magnate, whose fortune increased to $7.9 billion from $6.2 billion in 2014 and entered the top 10 list at nine. He recently bought heritage property Lincoln House in Mumbai for $110 million. "This year's list reflects the churn in the global economy and the growing clout of emerging sectors like ecommerce in India," Forbes India editor Sourav Majumdar added.